NorthFlex Neon™ offers hi-viz hand protection with exceptional fit and feel. The glove features a liner made of hi-viz yarn and a hi-viz PVC palm coating, which combine to provide excellent worker visibility. The advanced 15 gauge seamless nylon liner is stretchy and form fitting, with a snug knit-wrist, providing minimal resistance to hand movement for exceptional wearer comfort. The foamed PVC coating is soft and flexible enough to provide a degree of shock and vibration absorption, but tough enough to offer abrasion resistance that is comparable to polyurethane. The foamed coating also provides an open surface texture that clears liquids from surfaces, enabling a very firm wet-grip. The back of the glove is un-coated, for ventilation and wearer comfort and the glove contains no reaction causing natural rubber proteins. 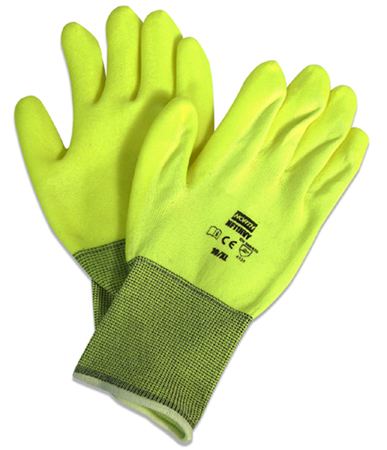 These gloves are well suited to applications where worker visibility is important, such as transport and construction. Hi-viz yellow color provides excellent worker visibility. 15 gauge seamless liner is stretchy and form fitting for wearer comfort. Ensures worker visibility when the worker's raised palm is towards the viewer. Foamed coating provides exceptional grip, particularly in wet conditions. Foamed coating provides good mechanical properties, including impressive abrasion resistance. Foamed coating is soft and flexible coating does not compromise tactility and dexterity. PVC coating contains no reaction-causing, natural rubber proteins. Extends the life of the glove, adding value. Available in sizes 7S to 11XXL to provide a safe and comfortable fit on a wide range of users. For more information on the NorthFlex Neon™ glove, please contact North Safety Products at 888-422-3698 or marketing@northsafety.com.